By Catherine on May 20, 2012 | Last Updated August 26, 2018 | 5 Comments | Medical Disclaimer | This Post Contains Affiliate Links - I may receive a commission if you purchase through links in this post. Today I would like to share one of my favorite ways to enrich my food with more minerals! The mineral sodium is very crucial to fluid balance in the body. Salting your food to taste is usually the best way to meet your body’s needs, because you let your cravings be your guide. If you have adrenal fatigue or if you are under high stress, you often lose an increased amount of sodium through your urine, which causes dehydration. Salting your food, or a pinch of salt in water is a good way to replenish electrolytes and help your body stay hydrated (as sodium helps your body hold onto water). Another AMAZING source of minerals is a type of seaweed called dulse (my favorite brand here). Dulse is rich in iodine, B vitamins, iron, chromium, and potassium. It also contains smaller amounts of vitamin C, A, and E . Iodine is especially crucial to your thyroid gland, making it instrumental in supporting your metabolism. If you’re not sure about your iodine status, you can do this simple 24 hour test at home to help you determine if you could benefit from adding small amounts of naturally occurring iodine to your diet. With dulse, you can easily grind it up into a fine power (vitamix or coffee grinder works great), and add it to your salt, which provides a simple way to spread more mineral rich love over your food. Find dulse on Amazon here. Have you ever had your calcium or potassium levels checked before to see how well your thyroid hormones are doing their job? High calcium can be a true driver of sluggish thyroid symptoms, as it slows down your body. The average American today gets far too much calcium relative to potassium. Typically, this isn’t because one is in too much calcium from food sources per say (although one could over-do it), but instead from calcium supplements, calcium fortified food, and/or increased calcium absorption from taking high dose vitamin D3. Part of vitamin D’s job is to tell your body to absorb more calcium from your food, pushing calcium levels even higher in the body, and pushing potassium levels lower. Pair that with a chronically low intake of potassium from fruits and vegetables, and you have yourself some powerful nutritional forces messing with your thyroid hormone’s ability to do its job. This often manifests with symptoms like fatigue, brain fog, low body temperature, blood sugar issues (hypoglycemia), and sluggish digestion. If you’re looking for even more ways to increase the minerals in your diet, try making DIY multivitamin in the form of a daily nettle/oatstraw infusion! Ready to find out how your diet measures up? Find out if your diet is giving your body what it needs with the Nutritional Debt Quiz! 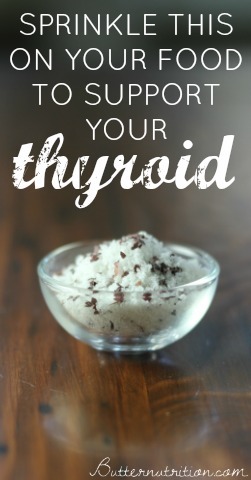 What food and supplements do you use to support your thyroid function naturally? Please share in the comments! 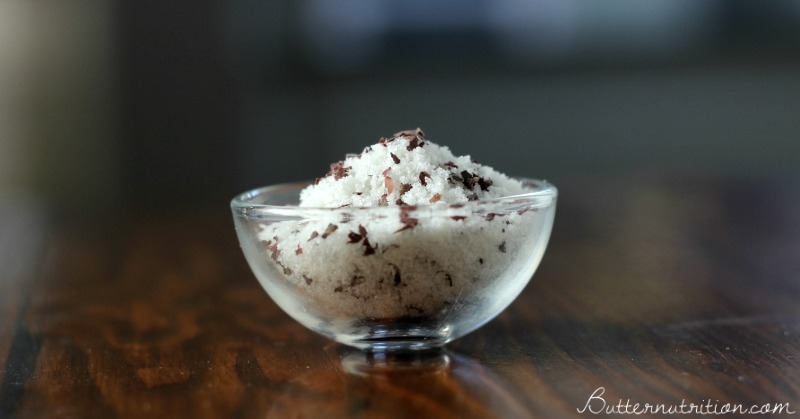 What a lovely way of increasing the appeal and health benefit of sea salt! Does not seaweed also contains a lot of anti nutrients? So it also blocks the mineral absorption? Can you please specify how much dulse to add to the salt? Use as much or as little as you want. The goal is to add just enough so you will like the taste and actually use it. I sprinkle about 1 teaspoon on everything I eat and started drinking green tea and oolong tea cut bread out and soda in 7 days I’ve lost 10.2 lbs!!!!! I feel fantastic and sugar levels are down from 244 to 150 I love it!